Wombats City Hostel Berlin was rated the most popular in Berlin at the 2011 Hoscars and it's no wonder. They're located near Alexanderplatz, Museum Island and Prenzlauer Berg and have 'a warm family-like atmosphere', according to our guests, who also praise the staff, saying they're 'always nice and they have a bunch of tops to give us for everything in the city'. We like their seventh-floor bar, featuring happy hour specials and a rooftop terrace. Awesome hostel with a rooftop bar. Wifi is absolute garbage though. If you work remotely or looking to be productive in any way, good luck. 100% would recommend to anyone looking for a hostel in Berlin. The staff was extremely helpful and pleasant and the atmosphere was what pushed it over the top! Hostel was almost perfect! 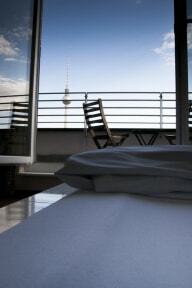 The location is perfect, about 10 mins walk to Alexanderplatz, and the views were amazing. Staff was helpful and they made us feel welcome on our stay. One small complaint is, that we were staying at the 6th floor, and the bar was on the 7th floor, so the music they were playing was pretty loud, but we got used to it pretty quickly. Perfect hostel for the value of money! Great hostel! Super cool rooftop bar and in a really nice part of town! Big hostel but you still get a nice close/family feel. Would definitely stay there again. Excellent location - right next to metro stop. Great place to stay if you're into the Generator/Wombats family of hotel feeling hostel vibes. I was traveling alone, not very social in terms of meeting others, but clean and safe, and a good base to explore Berlin. Very nice hostel. They accidentally put us in a private room not a dorm but still only required us to pay for the dorm room. Free beer on the first night. Rooftop terrace small but had a good view. If you are used to a good customer service then it might not be the place for you. Asking for 15min later check out to get a shower was answered with a big confusion at the reception with one word: no. The other one tries to be funny in the background: this is Germany. I have a suggestion for a new name for this hostel. It goes something like that: Wombats autistic service hostel. It fits quite well the bathroom for disabled people they gave me with a broken hand shower. Nice terrace tho! 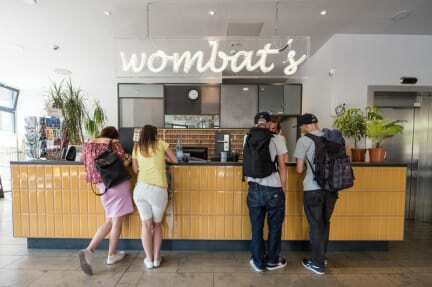 Wombats are party hostels but unlike most other party hostels we have decent rooms and friendly, professional service. We make sure we're not understaffed so we can take care of everyone's small and big concerns. We take cleanliness seriously-everyone expects not to find the waiter's hair in the soup and it should be the same at hostels.